I am sure that plenty of you folks out there may already know about this, but I thought I would share a few thoughts about it, just in case you may have missed it. If you would remember, some time ago, I actually put together a number of different blog entries where I was sharing some further details on how IBM, way back in 2005, came about putting together a bunch of what then was called IBM‘s Blogging Policy & Guidelines, in order to help guide IBMers who were new to the whole blogging phenomenon and didn’t know how to get things going. Back then I mentioned how the guidelines were actually created by a bunch of us, early adopter bloggers, who spent a few days chiming together in a wiki space, putting them together and then passing them to the powers that be for the final approval. Well, fast forward to May 2008! Exactly three years later those same Blogging Policy & Guidelines have now been updated to become a bit more generic, but still with the same outstanding quality as ever before. Yes, that is right. Let me present to you folks IBM’s just recently updated Social Computing Guidelines. As you may have noticed, these newly updated guidelines cover a bit more ground than just blogging. They now include most social computing activities out there, including virtual worlds and sharing of rich media. As far as I could see, this update we very much needed, since last time they were looked at was about three years ago and time and time again folks were wondering when they would be going through a revision, since three years in the current social computing world is just quite a lot of time without doing much about it. Perhaps it wasn’t even necessary, who knows, but, at least, the update is now done and ready for everyone to take a look and see what’s changed. I have noticed already how a whole bunch of people have actually been mentioning them already in their corresponding blogs as well, both fellow IBM colleagues and other folks interested in the world of social computing in general. And by now you may be wondering how the update took place this time around, right? Well, as mentioned in most of the different blog posts mentioned above we used a couple of blog entries with some massive discussions taking place, then consolidating the first initial drafts in a wiki space and contributing some more in there, and, finally, going through a final round of comments uploading them into Cattail and asking folks to comment about them for a final round. Then a couple of weeks later my fellow colleague, and good friend, Adam Christensen, unleashed them to the world and we are back in business! 1. Know and follow IBM’s Business Conduct Guidelines. 2. IBMers are personally responsible for the content they publish on blogs, wikis or any other form of user-generated media. Be mindful that what you publish will be public for a long time — protect your privacy. 3. Identify yourself — name and, when relevant, role at IBM — when you discuss IBM or IBM-related matters. And write in the first person. You must make it clear that you are speaking for yourself and not on behalf of IBM. 4. If you publish content to any website outside of IBM and it has something to do with work you do or subjects associated with IBM, use a disclaimer such as this: "The postings on this site are my own and don’t necessarily represent IBM’s positions, strategies or opinions." 5. Respect copyright, fair use and financial disclosure laws. 6. Don’t provide IBM’s or another’s confidential or other proprietary information. Ask permission to publish or report on conversations that are meant to be private or internal to IBM. 7. Don’t cite or reference clients, partners or suppliers without their approval. When you do make a reference, where possible link back to the source. 8. Respect your audience. Don’t use ethnic slurs, personal insults, obscenity, or engage in any conduct that would not be acceptable in IBM’s workplace. You should also show proper consideration for others’ privacy and for topics that may be considered objectionable or inflammatory — such as politics and religion. 9. Find out who else is blogging or publishing on the topic, and cite them. 10. Be aware of your association with IBM in online social networks. If you identify yourself as an IBMer, ensure your profile and related content is consistent with how you wish to present yourself with colleagues and clients. 11. Don’t pick fights, be the first to correct your own mistakes, and don’t alter previous posts without indicating that you have done so. 12. Try to add value. Provide worthwhile information and perspective. 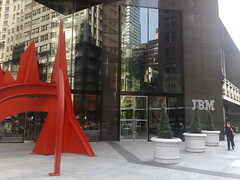 IBM’s brand is best represented by its people and what you publish may reflect on IBM’s brand." Oh, and here is something else rather important and relevant as well to the conversation; now you would probably know, too, how thanks to those Social Computing Guidelines there isn’t a chance I would be in any kind of trouble with my management line on what I am trying to do, as plenty of folks have been commenting to me on the side, as I mentioned in a previous blog post. When in doubt, it is always a good thing to know that they are there to help, guide and encourage you to push the limits, because after all you are the one who sets those limits in the first place! Thus how far do you want to go? PS. Very nice! Now, incidentally, as I am about to post this entry I see that Linda Skrocki, from Sun Microsystems, has been commenting how they have just recently updated their own Sun Guidelines on Public Discourse. Excellent stuff! Another one to add to the list! Let’s keep it up and continue to spread the message! Is this an example of an IBM employee picking a fight? Or adding value? It looks like an example of Ed Brill and his band of “useful idiots” beating a real person, in this case Christine Herbert, to a pulp. She has since left Tech Target. I wonder why? Today we had a guest speaker, Ed Brill from IBM. I noticed he got a little defensive on the subject of Exchange versus Notes but that goes with his territory is my guess. … The highlight of the evening was his discussion on the power of the blog to mobilize the masses. His story about “searchdomino.com” that was advertising Micorosft’s migration tools, was in my opinion very insightful. The outcome of this episode was credibility damage that led to searchdomino loosing its subscription base and in turn its advertising revenue. Fair play? Or in violation of IBM policy? I don’t see how the discussion about SearchDomino was a “policy violation”. It is important for Lotus customers and partners to know who our partners are, who are the organizations that are helping move the market forward. SearchDomino, by name, implies that they are, but for the last many months, it has been clear that they are not — their editorial staff is making a valiant attempt to publish occasional new content, but they lag the blogs significantly and haven’t done any original interviews or stories in a long time. There is an implicit endorsement of SearchDomino in the community by IBM, and if the community isn’t aware of the problem, then silence means consent. I tried to take the discussion offline first, but never received an e-mail response to repeated messages. It certainly got a bit personal in that thread, but only because SearchDomino adamantly refused to take any message to their subscribers. They considered this a fire to put out, not a core issue with their perception in the market. That’s a problem for IBM, and something the marketplace at large *needs* to know. Christine’s departure was unrelated (at least not directly) to this, as far as I have been told. By the way, it’s interesting that you post this comment on Luis’s site and not on my own. Perhaps my rigid requirement that posters use their real name and e-mail address is why, but I think that is how we keep the level of discourse at useful rather than flames. I stand by the way that the discussion about SearchDomino was conducted as being relevant and professional, even professionals can admit frustration at times. You should sign your own comments in the future, imho. In fact, it is actually one of the golden guidelines from the updated IBM social computing guidelines themselves: identify yourself…. Next time the occasion arises let me encourage you to share your thoughts and feedback and truly engage in the conversation. Keep it anonymous is not going to help anyone. Not even the conversation itself. Still, want to take this opportunity to thank you for the input and for the thoughtful comments and hope Ed’s answer would help address your concerns on the topic. Social computing is a component of Web 2.0 that is characterized by blogs, tagging of Web sites and social networking, and has thus far had a greater impact among consumers than businesses. Jeff Schick, vice president of social software at IBM, referred to it as an enterprise ready, social software platform offering, built as loosely coupled, extensible services that promise an integrated environment for collaboration. IBM takes the concept of social computing and puts it in a business context, and it’s not something I have seen anyone else do, he said.